Handy Backup is the perfect solution for PostgreSQL backup and recovery. It allows hot backup of your data without PostgreSQL database stopping. Let us reveal all possibilities of PostgreSQL auto backup under Windows with Handy Backup! Handy Backup provides some crucial advantages for perfectly saving PostgreSQL data without slowing down a routine job on the server running a PostgreSQL database engine instance. Handy Backup can save all the database information without stopping the database engine. All operations will continue (including transactions), and a user backing up data does not have a need to stop or partially slow down the server. Handy Backup allows selecting PostgreSQL backup schema, databases, procedures or settings to save using a tool called “PostgreSQL” for all these actions. This action works completely in automated mode, seeking and saving any data selected by a user. To utilize PostgreSQL auto backups with a peak efficiency, a user must have a possibility to change, replicate or mirror the database or schema backed up. Handy Backup saves PostgreSQL copies in a native, readable format available for changing, and allows cloning and replicating backups. Control procedures, from starting as a Windows service to running other apps with a task. See PostgreSQL database backup features for more information. The Small Server Solution can backup, restore, compress, encrypt, clone and mirror your PostgreSQL databases and any other data on a single server. Free 30-days trial version! In Handy Backup, create a new backup task. 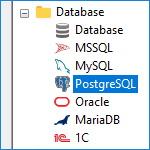 Select PostgreSQL on the Step 2. If you do not have a PostgreSQL configuration, create a new by selecting an option allowing it. To create a new configuration, enter your DBMS connection parameters into the dialog. When you have a configuration to back up data from it, choose it and select particular data. On the Step 3, select a data storage for your PostgreS backup table set. Choose a backup type on the Step 4, setting up timestamps and versioned keeping if you need. An advice: We are not recommending selecting PostgreSQL incremental backup, as it can give up to no bonus in terms of space and, especially, time used for backups. Use the differential backup instead whenever it is possible! Proceed to create other task parameters, as described in the User Manual for backup tasks. Note: You must have a sufficient user privileges to use a PostgreSQL SELECT statement for creating PostgreSQL backup with the tool provided. 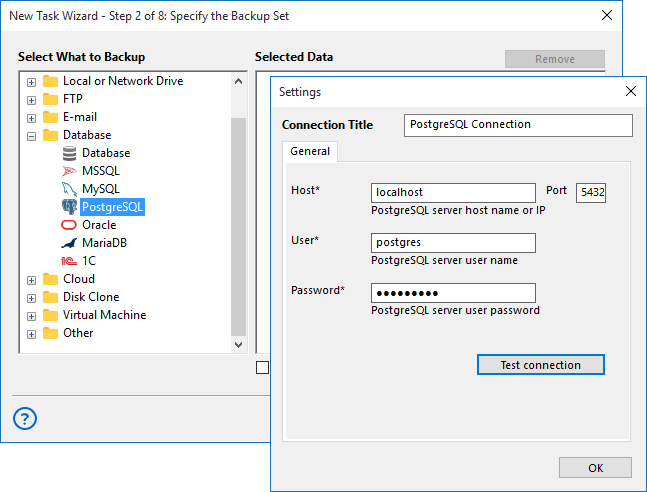 Handy Backup saves PostgreSQL backup data as a typical database, and users can open these backups as the standard PostgreSQL files, to modify, explore or restore the information. In addition, Handy Backup allows creating a restoration task, with a procedure changing only by a little from a backup task. With Handy Backup, you can restore your database to another place than the original dataset was located. Using this technique, you can quickly clone or mirror your PostgreSQL backup database to as many copies as you need. Try the automated PostgreSQL backup feature with Handy Backup on a 30-days free trial period, downloading a newest version of Handy Backup immediately from our website! PostgreSQL backup is available in two versions of Handy Backup - Small Server and Server Network. Both versions will provide you with a full-featured backup, but there are some differences. Small Server is designed for a single computer, Server Network option is designed for multiple computers or a backup over the network.